Apple's iOS beat Android in U.S. operating system sales share for the first time since Q4 2012, according data from Kantar Worldpanel ComTech. The company's share of sales also grew across Europe and China, thanks to its new devices. The iPhone 6 was the best selling smartphone in the U.S. throughout the holiday quarter with the Samsung Galaxy S5 coming in at number two. 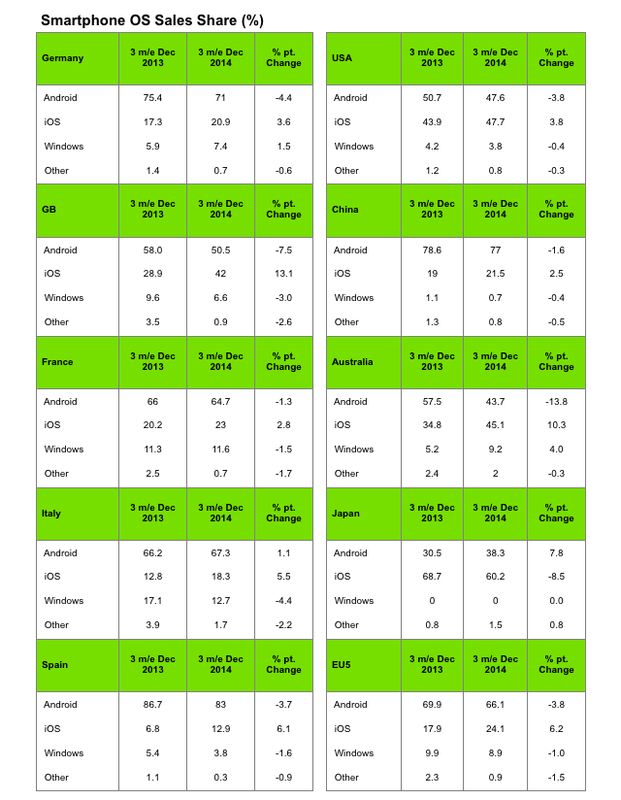 In Europe, iOS share grew 6.2% year-on-year while Android fell 3.8% to 66.1%. Great Britain saw the biggest jump in iOS share, growing by 13.1%. While Xiaomi was the best selling brand in China, Apple was able to close the gap slightly. “In Urban China, Apple iOS grew share year-on-year at the expense of Android,” explained Tamsin Timpson, strategic insight director at Kantar Worldpanel ComTech Asia. “While Xiaomi remained the bestselling brand in the latest period, Apple was able to close the gap slightly, growing its share to 21.5% from 19% last year.” Almost a quarter of Chinese consumers who bought an iPhone in the past three months were acquiring their first smartphone, compared to 16.5% for the same period in 2013. Kantar notes that smartphone penetration has reached 59% in the U.S. and 67% in Europe's top five economies (Great Britain, Germany, France, Italy and Spain). Emerging markets still have a long way to go with Brazil and Mexico having just 35% and 37% penetration, respectively.